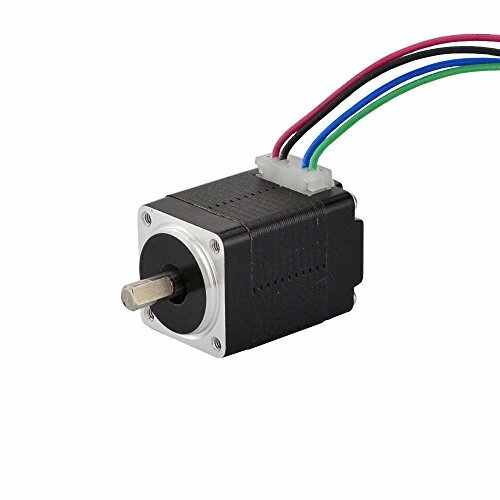 This hybrid bipolar stepper motor is the miniature stepper motor we carry, it with 1.8 deg. step angle (200 steps/revolution). Each phase draws 200 mA at 4.8 V, allowing for a holding torque of 1.6Ncm(2.3oz.in). Electrical Specification: * Manufacturer Part Number: 8HS11-0204S * Motor Type: Bipolar Stepper * Step Angle: 1.8 deg. * Holding Torque: 1.6Ncm(2.3oz.in) * Rated Current/phase: 0.2A * Phase Resistance: 24ohms * Inductance: 8mH+/-20%(1KHz) Physical Specification: * Frame Size: 20 x 20mm * Body Length: 28mm * Shaft Diameter: 4mm * Shaft Length: 10mm * D-cut Length: 7mm * Number of Leads: 4 * Lead Length: 300mm * Weight: 60g Connection: Black(A+), Green(A-), Red(B+), Blue(B-) Warning: Make sure the motor connect to a constant current or chopper drive controller before you test motor. Connecting the motor directly to a power supply will destroy the motor.